Nourish Organic Market, a small grocer that provides local and organic food, now offers free delivery for their Fresh For You food baskets as a way to make groceries more accessible and supporting local farmers easier. Nourish Organic Market prides itself on being the 3rd best place to get food- next to having a personal garden and buying directly from a farmer. What started as an online store called Artisan Food is now a market that connects with farmers to sell organic or organically grown, local and grass-fed pastured food. Sheri Rop, owner of Nourish Organic Market, says her business came out of her growing understanding of environmental issues, specifically the negative impacts the food production system has on the earth and health of people. Rop says one of her major concerns is when the only standard for food production is how cheap a product is. She says quality, value and effort of producing food should be higher priorities in our food-buying choices. “If food is cheap, there’s always exploitation involved because real and honest food involves people doing back breaking work to bring it to our kitchen tables,” Rop says. The purpose of the Nourish Organic Market is to make local and organic food more available to consumers and to support farmers. Green Wagon Farm, EarthKeeper Farm, Groundswell Community Farm and Growing Green Family Farm are a few places where Nourish sources their produce. “If we’re going to expect farmers to change everything they know and start using organic methods, we need to demonstrate there’s a market for it. We won’t sell a local product here if it’s not organically grown and will only sell commercial products if they’re certified organic,” Rop says. Ron Wheaton, the produce manager, studied sustainable food systems at Grand Valley State University. 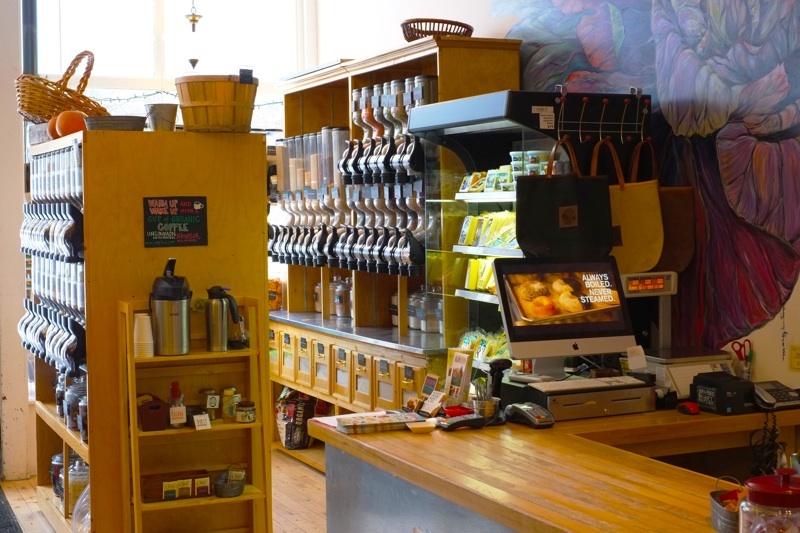 He says Nourish is an example of one of the best ways we can go about creating and enacting a sustainable food system and the store has high standards in terms of their sustainability practices. Wheaton says buying local is about creating community cohesion, because when people get to know and value the land where their food is grown he thinks that has a huge effect on the community in terms of respecting the land. “My goal is to support local farmers and connect them with people. A lot of people come into the store saying ‘I’m just getting started on this whole organic thing’ and I was in their shoes just a few years ago so I help them. When I’m able to do these things it’s the greatest feeling because that’s where my passion is,” Wheaton says. 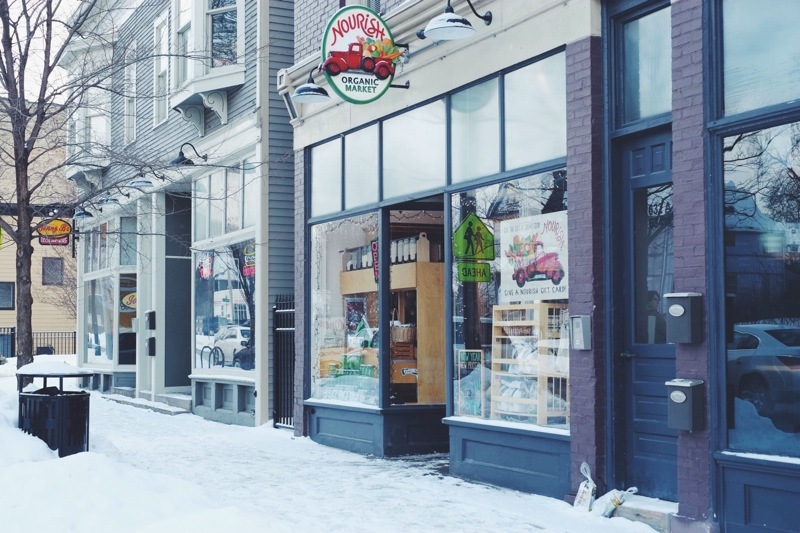 Nourish Organic Market now also provides free delivery and in-store pick up for groceries. The Nourish Basket and Delivery program also offers a year-round membership description that delivers seasonal groceries every week. The two plans available are the Locavore Farm Basket, which comes in small ($35), medium ($52.50) and large ($70), and the Paleo Farm Basket, which is $75. Each basket includes a newsletter with recipes, food facts and information about the local farms. Rop says because Nourish Organic Market is connected with so many farmers, the advantage of the baskets is that it includes a balance and a wide variety of fruits and vegetables. Margi Peterson, a Midtown resident and regular customer, started shopping at Nourish because she changed her diet to Paleo and includes organic food. 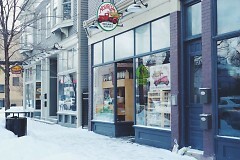 The market is located near her house and en route to work. Now she says she barely buys food anywhere else. “I like the staff; the people are all really friendly and conscientious. I also love being able to pick up something healthy to eat at their deli. It’s nice to know I can pop in there and get something that fits my diet,” Peterson says. Nourish Organic Market currently works with Reformation Growers for composting food waste. They are applying for a grant for heritage breed pigs, which are endangered and purebred animals, to use for recycling the produce loss. The market is a member of the Livestock Conservancy, a nonprofit organization that works to protect endangered livestock and poultry from extinction. The business is also working to become B Corp certified, which requires a business to meet standards of social and environmental performance, accountability and transparency. Rop says in the future she is interested in finding a way to expand the space of Nourish Organic Market to have more room for classes and programs to connect people with farmers.